The Princeton Rays, led by Appalachian League MVP Wander Franco, have already locked up a spot in their circuit's postseason. On Friday, their parent club gave them two big reinforcements. The Rays have promoted 2018 first-round Draft picks Matthew Liberatore and Shane McClanahan, both left-handers, from the Gulf Coast League to Rookie-level Princeton. Liberatore was one of the GCL's standout performers before making the jump. The 18-year-old posted a 0.98 ERA with 32 strikeouts and 11 walks in 27 2/3 innings and did not allow an earned run in his final five appearances (21 2/3 innings). Ranked as the No. 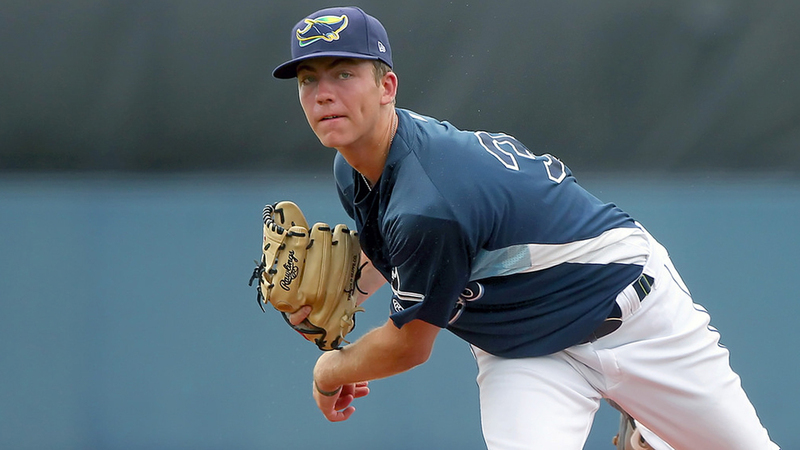 4 Draft prospect in his class, Liberatore dropped to the Rays at No. 16 due to signability concerns but ended up taking a below-slot $3,497,500 bonus. MLB.com's No. 65 overall prospect has plenty of size at 6-foot-5, 200 pounds and sports four above-average pitches in his fastball, curveball, slider and changeup. McClanahan has significantly less pro experience. The 21-year-old left-hander made only two appearances in the GCL, but was nearly spotless in both, striking out six while allowing one hit over three scoreless frames. The Rays took him at No. 31 overall out of the University of South Florida and gave him an above-slot $2,230,100 bonus on the strength of his high-90s fastball and plus changeup. McClanahan owned a 3.42 ERA with 120 strikeouts and 48 walks in 76 1/3 innings in his junior season with the Bulls, and it was those control woes, along with a frenetic delivery, that allowed him to fall to 31 despite the potentially elite stuff. He's ranked as the Rays' No. 8 prospect. At 39-21, Princeton owns the best record in the Appalachian League and has already clinched a playoff spot with Danville, Pulaski and Burlington eliminated in the East Division. It could get home-field advantage in the semifinal round if it can hold off Bluefield, which sits two games back at 38-24, for the division crown.